Wills and Trusts are supposed to give family members an easy means to hand down assets to the next generation without any problems. Unfortunately, sometimes a Will or Trust does not work as expected. This can occur when a Will or Trust is created by a parent who did not know what they were doing at the time; or a parent who is forced to create something they didn’t really want. Other times, people feel like they can take whatever they want from the personal who has passed away without regard to a Will or Trust. When you are the victim of someone who highjacks your parents’ intent to give you money, the burden is on your to take action. In these cases, the courts will need to get involved and you will need a great lawyer. If this happens you need a law firm who can fight for your rights and the rights of the person who created the Will or Trust. 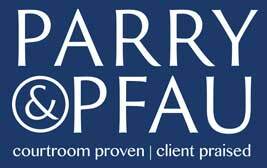 That firm you need is Parry & Pfau. Clients hire us because we fight in the courts for the rights of those who have been taken advantage of. We are experts in handling Trust Litigation, Will Litigation and Probate Litigation. We handle every aspect of the case all the way through to trial. Our drive to fight for your rights and get you the best results possible has helped us earn our strong reputation. We care about our clients and fight for what is best for them. If you have a case that involves trusts, wills, or probate litigation in Las Vegas, Nevada or Southern California you should call the experienced attorneys at Parry & Pfau first. We can help you understand your options and represent you in court. Call us today at 702-879-9555 or click here to request a meeting time.